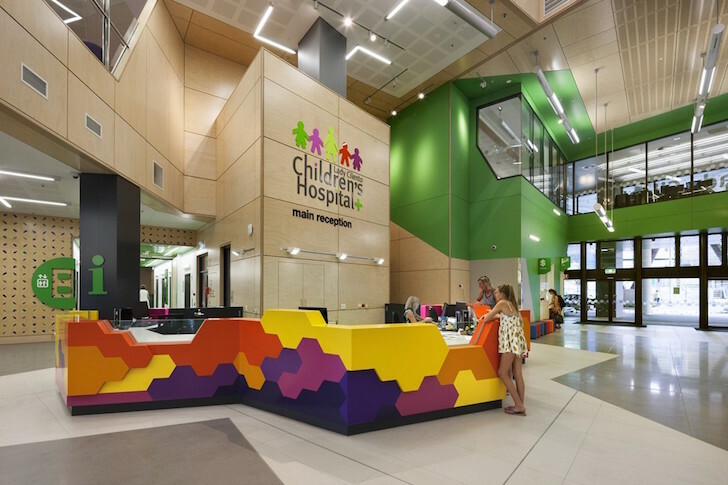 The Lady Cilento Children Hospital draws its young visitors in with its eye-catching and brightly colored purple and green ribbed facade; the nearby native Bougainvillea plant palette inspired the coloration. The architects rejected the conventional monolithic building type in favor of a sculptural form that swells into a shape of a green mountain topped with landscaped rooftops. The interior takes a “salutogenic” design approach in that the architects researched and applied designs shown to help support patient recovery, such as clear wayfinding, views of nature, and access to green space, rooftop gardens, and green walls. “Design work began with research into the genealogy and typology of the contemporary hospital. We studied hospitals from the 1980s though to the present day and saw these as being largely functionally driven and medico-centric in their planning”, says Corbett Lyon of Lyons, Design Director on the LCCH project. The hospital’s spatial layout is organized like a “living tree” and comprises two light-filled atriums from which a network of double-height spaces branch out. Those branches end in large glazed walls that frame views of key landmarks and natural landscapes in Brisbane. Nature-inspired art punctuate the hospital to bring bright splashes of color indoors and to further engage patients. 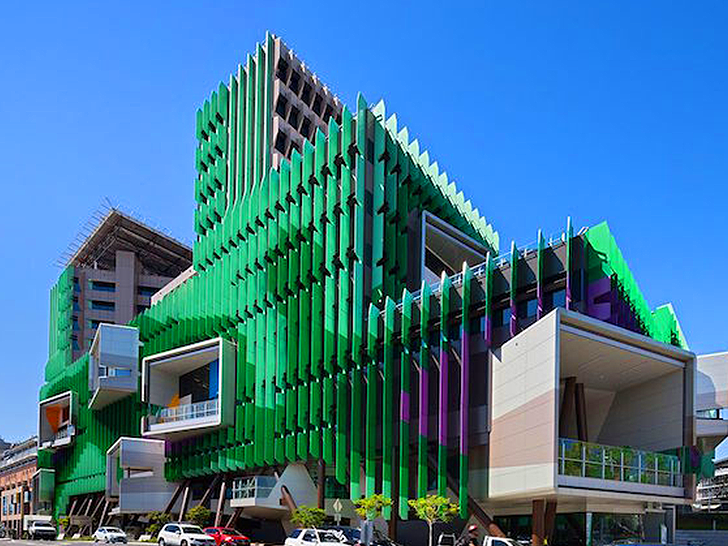 The Lady Cilento Children Hospital draws its young visitors in with its eye-catching and brightly colored purple and green ribbed facade. The architects rejected the conventional monolithic building type in favor of a sculptural form that swells into a shape of a green mountain topped with landscaped rooftops. The nearby native Bougainvillea plant palette inspired the coloration. The interior takes a “salutogenic” design approach in that the architects researched and applied designs shown to help support patient recovery, such as clear wayfinding, views of nature, and access to green space, rooftop gardens, and green walls. “Design work began with research into the genealogy and typology of the contemporary hospital. We studied hospitals from the 1980s though to the present day and saw these as being largely functionally driven and medico-centric in their planning”, says Corbett Lyon of Lyons, Design Director on the LCCH project. The hospital’s spatial layout is organized like a “living tree” and comprises two light-filled atriums from which a network of double-height spaces branch out. Those branches end in large glazed walls that frame views of key landmarks and natural landscapes in Brisbane. Nature-inspired art punctuate the hospital to bring bright splashes of color indoors and to further engage patients. The architects added green roofs and green walls to increase access to nature.